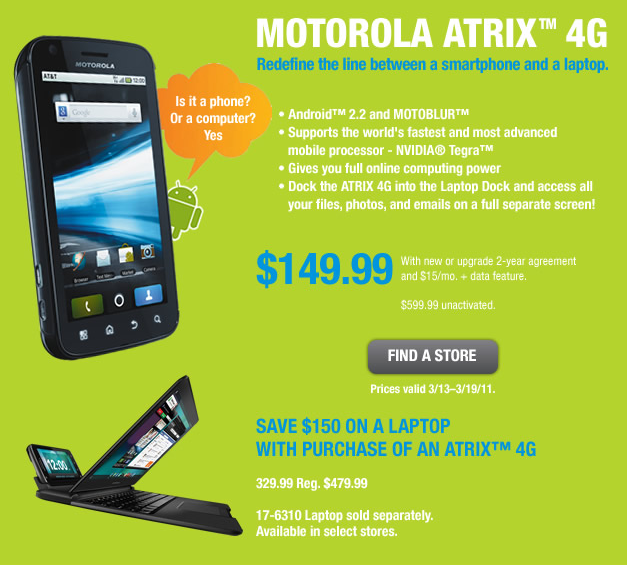 AT&T has officially started selling the Motorola Atrix 4G for $199.99 with a 2-year contract. 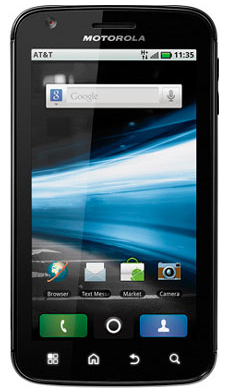 Additionally, true to its word, RadioShack has also started offering the Android 2.2 smartphone for $149.99. The dock will set you back a further $329.99 when bought with the phone or $479.99 when purchased separately. The advertisement for the Atrix 4G on the RadioShack website. Not to be outdone, Amazon has the device for $149.99. The phone and dock can be purchased as a bundle for $499.99 (after a $100 mail-in rebate and purchase of the Data Pro 2GB/4GB plan with tethering), while the dock on its own costs $499.99. However, if you're really looking for a good deal, pick the phone up from Walmart, who is offering the device for $129.99. But hurry, as this offer ends Thursday.